Air shocks have been around for a long time. King’s quality materials, unique design features and precise tolerances are what set our air shocks apart. King air shocks offer infinite height and pressure settings in addition to our easily adjustable valving. Tubular, hard chromed shafts further reduce the weight and urethane seals insure proper sealing and long life. The quality of our internal sealing allows you to set-up your air shock to also function as a bumpstop if needed. Critical importance is placed on the Schrader valve of an air shock so we developed our own unique Schrader cover that mounts to the body of the shock instead of the valve itself to protect the valve and act as a double seal giving you gas it and forget it peace of mind. King’s air bypass shock provides the features of our air shock with the position sensitive damping control of our bypass design. This shock is a prime example of King’s custom built for your application approach. If you don’t see it, ask for it. Once you experience King shocks you will know there really is a difference. Nothing rides like a King. King Air Shocks are built from the highest quality materials available. They provide a compact and lightweight option when used in the appropriate application. Air shocks ride on the pressurized gas charge inside (nitrogen). All air shocks are limited in their use by the physical properties of nitrogen gas. Nitrogen expands when it gets hot and contracts when it cools. In a lightweight rock crawler that only travels a few hundred yards during a full day of competition this is not a problem. If you plan on running on the trail or the street for any length of time it becomes an issue. When shocks work, they create heat. The heat causes the gas inside an air shock to expand which then extends the shock and changes the damping, it gets stiff. The same thing happens in reverse when the gas inside cools. You could start out on your favorite trail under sunny skies but as you gained elevation and the air got colder, your ride height could be much lower. You would get hung up easier because of the lower ride height. 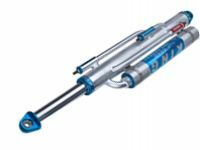 If you are driving a competition only rig and are looking to save weight above all else, air shocks may be the right shock for you. If you plan on driving on the street or running trails King Shocks has a complete product line of coilover and bypass shocks to choose from that will give you the most versatile performance for your rig.